The General section allows you to set search and filter settings. Click the toggle buttons to the left of the rule to turn it on or off. —indicates the rule is on. —indicates the rule is off. 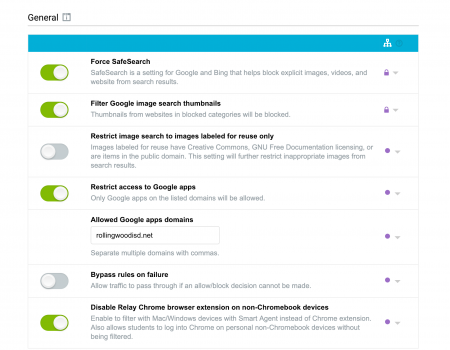 Force SafeSearch – forces all of your users to use Google or Bing’s SafeSearch filter. 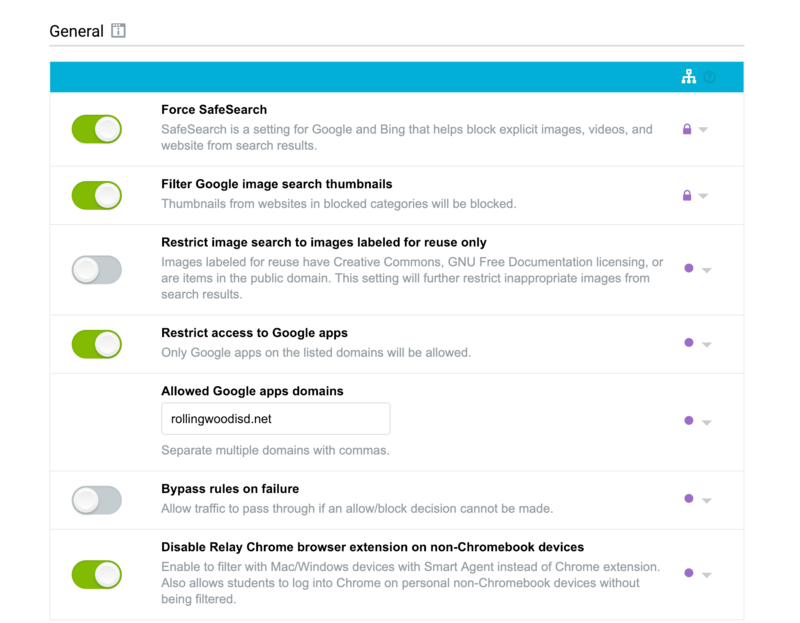 Filter Google image search thumbnails – blocks thumbnails in a Google image search that are from websites in your blocked categories and Custom Block List. Restrict image search to images labeled for reuse only – Images labeled for reuse have Creative Commons, GNU Free Documentation licensing, or are items in the public domain. This setting will further restrict inappropriate images from search results. Restrict access to Google apps – limits your users’ access to Google apps domains that you have permitted. Add permitted Google apps domains in the Allowed Google apps domains text box. When adding multiple domains, separate them with a comma. Note: This function is only supported in Relay extension versions 2.1.15 and higher. Bypass rules on failure – allows traffic to pass through if Relay cannot make an allow or block decision. Disable Relay Chrome browser extension on non-Chromebook devices – sets Relay to only filter and report with the Windows or Mac Smart Agent when users are logged into a Chrome browser on a non-Chromebook device. 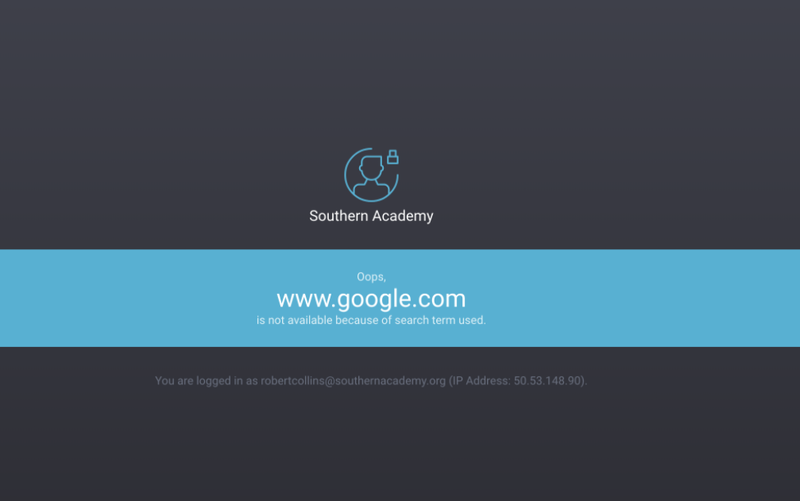 Note: The Restrict access to Google apps (including the Allowed Google apps domain field) and Bypass rules on failure options are not availble on the After School Rules page. You can lock General settings for each subsequent group in the Relay hierarchy by clicking on the arrow to the right of the settings and clicking Lock. You can block or allow access to popular social media platforms in the Social Media section. Click on the toggle buttons to the left of the social media platform to allow or block access. —indicates the social media platform is allowed. —indicates the social media platform is blocked. 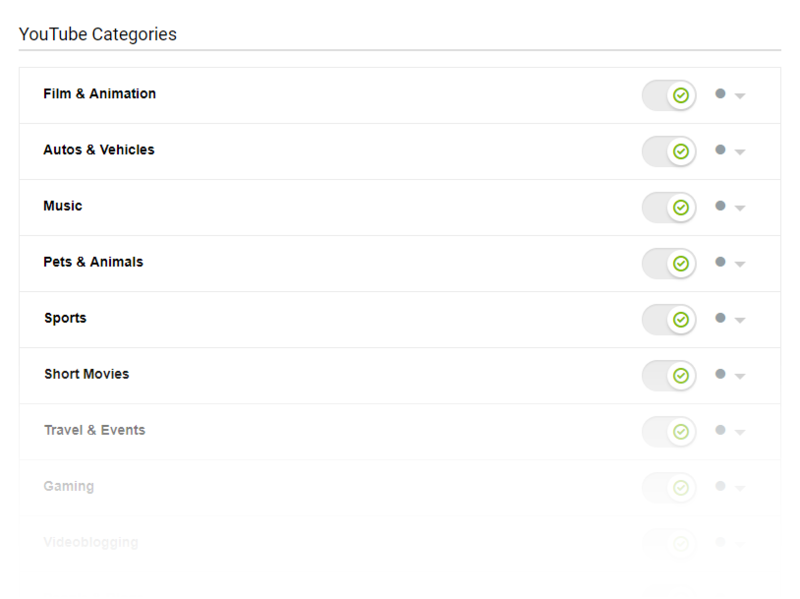 Categories allow you to block websites by category instead of having to block each website individually. 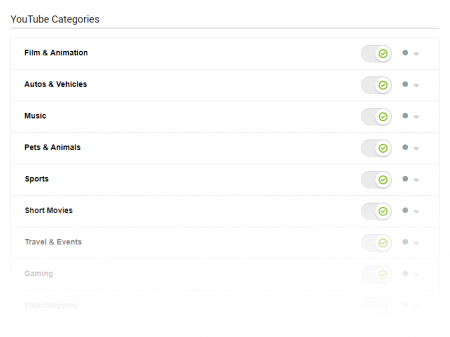 Each category has a category name, a definition, and a toggle button to allow or block the category. Click the toggle button to the left of the category to allow or block access to the category. —indicates the category is allowed. —indicates the category is blocked. If you are unsure of how a website is categorized, enter the website URL into the Enter a website or youtube video/channel to check… search bar at the top of the page and click Check. In the following example we searched for www.reddit.com. The results show that Reddit is categorized as Mature. This means that blocking the Mature category will block Reddit (or that allowing the Mature category will allow Reddit). 1. Click the edit icon ( ) next to the category to open the Edit Domain Details dialogue box. 2. In the Edit Domain Details dialogue box, click the Category drop-down menu and select a new category for the website. In the following example, we changed the category for www.reddit.com from mature to forums.blogs. YouTube Controls – Various YouTube options, including Restrict Mode, hiding comments, and hiding the sidebar. YouTube Categories – YouTube video categories that you can choose to allow or block. Custom Allow List – Videos and channels that are always allowed, even if they are flagged or belong to blocked Categories. Custom Block List – Videos and channels that are always blocked, even if they belong to allowed Categories. The Relay YouTube section also allows you to set several YouTube Controls. You can turn the options on ( ) or off ( ). Force Restricted Mode – This option enables YouTube’s Restricted Mode, which hides any videos that YouTube determines to be inappropriate. You can learn more about Restricted Mode in this YouTube help video. Note: Disable Restricted Mode if Smart Play is enabled. 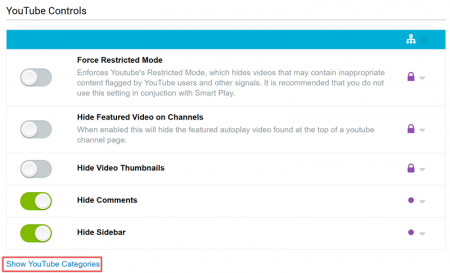 Hide Featured Videos on Channels – This option hides the featured autoplay video found at the top of a YouTube channel. Hide Video Thumbnails – This option hides video thumbnails on YouTube. 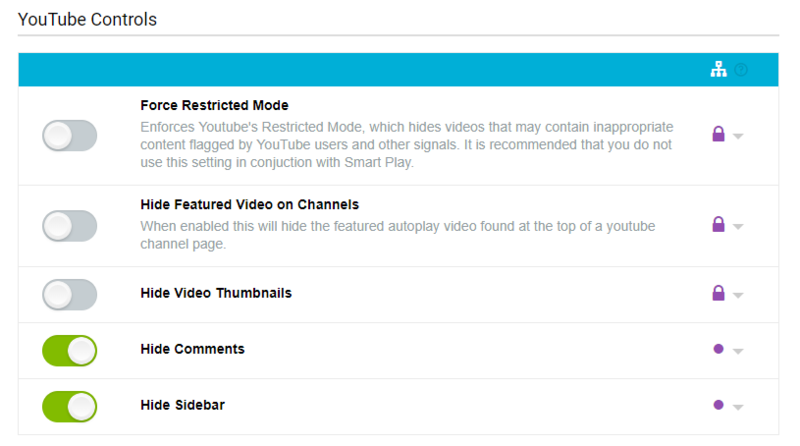 Note: Disable Hide Video Thumbnails if Smart Play is enabled. Smart Play automatically hides all blocked thumbnails. Hide Comments – This option hides comments on YouTube videos as well as discussion comments. YouTube allows users to leave comments on videos. These comments are usually not moderated and can contain offensive language. 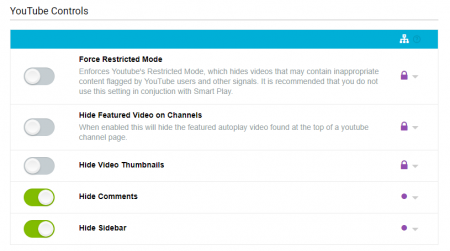 Hide Sidebar – This option hides the YouTube sidebar, which contains related videos. These related videos are determined by a complex algorithm that suggests videos related to the video currently being watched as well as videos that the user might find interesting based on their browsing history. These videos could be offensive or distracting or could contain videos that are in your blocked categories. Note: If you’re using Smart Play, we recommend enabling Hide Featured Videos on Channels, Hide Comments, and Hide Sidebars. If you’re not using Smart Play, we recommend enabling all YouTube Controls. YouTube classifies channels and videos into categories. You can see all categories by clicking the Show YouTue Categories link under YouTube Controls. Note: Categories are not available if Smart Play is enabled as Smart Play overrides YouTube’s native categories. We recommend using Smart Play over YouTube Categories as Smart Play intelligently categorizes videos while YouTube categories are set by video uploaders, who do not always categorize videos correctly. – indicates the category is blocked. – indicates the category is allowed. You can use the Custom Allow List to allow videos that are in blocked categories. 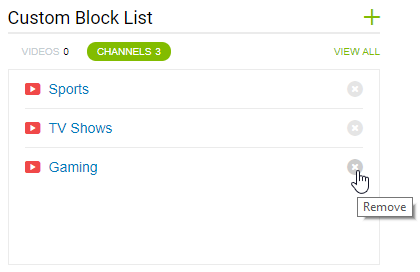 You can use the Custom Allow and Custom Block lists to manually block or allow YouTube videos and channels. You can sort between videos and channels on your lists by clicking the and buttons (the number in the button identifies how many videos or channels are currently in the list). Enter the YouTube video or channel URL you want to allow in the Link field and click Allow. The video is now in the Custom Allow List. The videos and channels are ordered chronologically by last added. To block a video or channel, follow the same steps but click the in the upper-right corner of the Custom Block List, add the YouTube video or channel URL, and click Block. To delete a video or channel from the Custom Allow or Custom Block list, click the to the right of the video or channel you want to delete. The Custom Video Lists page gives you an alternate view of your Custom Allow and Custom Block lists. 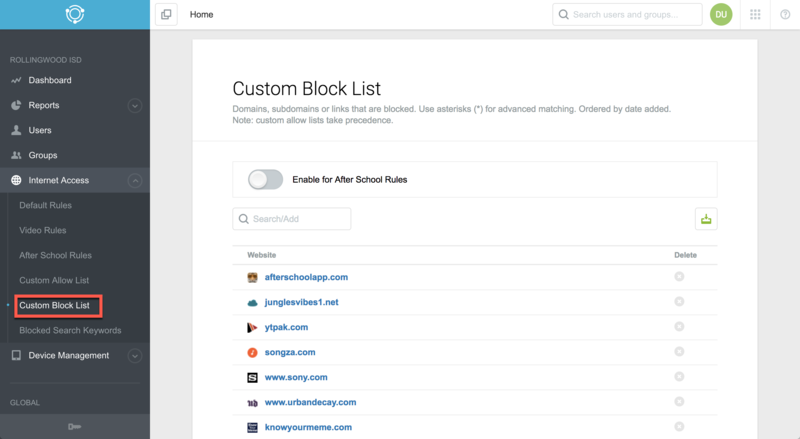 Here you can also enable Custom Allow and Block list functionality in After School Rules. To access the Custom Video Lists page, Click View All in the upper-right corner of the Custom Allow or Custom Block list. From here, you can also enable Custom Video Lists for After School Rules. 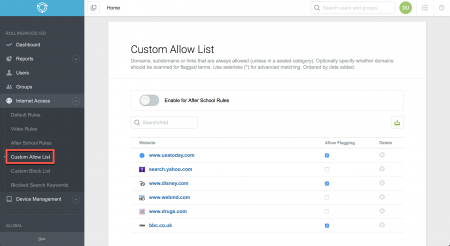 Enabling Custom Video Lists for After School Rules allows or blocks the videos and channels in your Custom Allow and Custom Block lists when After School Rules are applied. 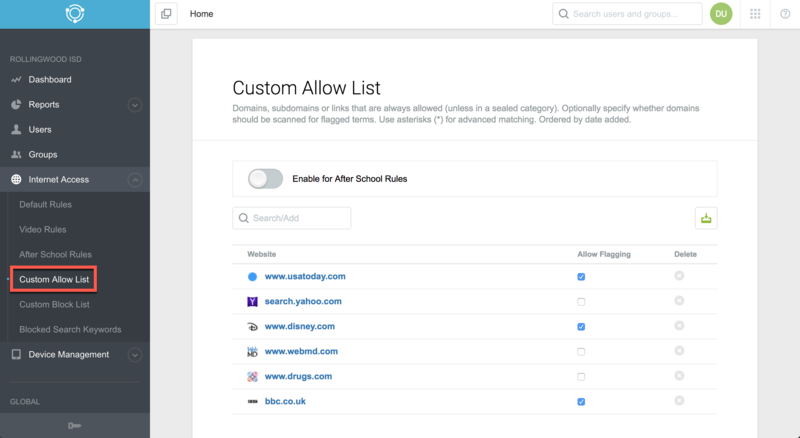 To enable your Custom Allow and Custom Blocked lists when After School Rules are applied, click the Enable for After School Rules toggle button. Enabling Allow Overrides gives designated users the ability override video blocks except for videos in the Custom Block List and videos blocked by Smart Play. You can designate override users in the Users section of Relay. Enable the Allow Overrides option by clicking the toggle button. 1) Smart Play overrides any other setting as long as Restricted Mode is turned off (Restricted Mode should always be turned off when using Smart Play.) Smart Play Allowed and Blocked lists override Smart Play categorization. 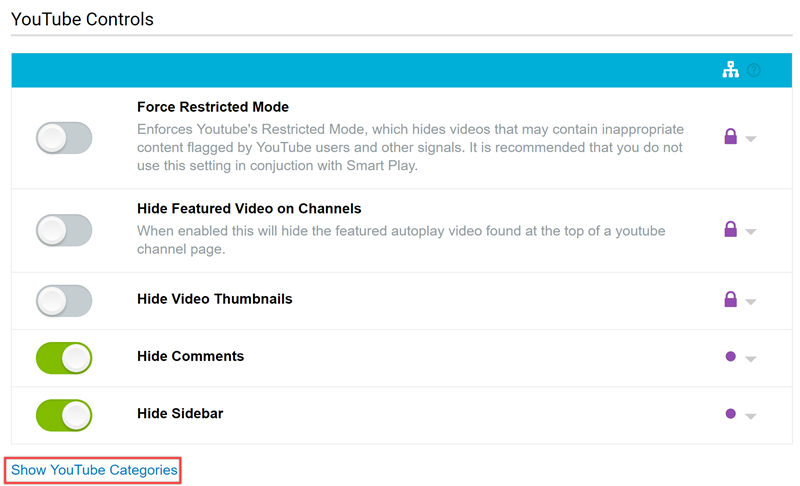 2) If you are not utilizing Smart Play, then YouTube’s Restricted Mode overrides any other setting. If you have the Enable YouTube’s Restricted Mode option turned on, then every single video categorized as “restricted” by YouTube will be blocked, even if it is within an allowed category or placed in the Allowed Videos & Channels list. Practically all videos that YouTube categorizes as “restricted” are of no educational merit, so you should not encounter a scenario in which you want to allow a restricted video. 3) The Allowed Videos & Channels and Blocked Videos & Channels lists override Categories. A channel or video that appears in one of these lists will always be either allowed or blocked (depending on which list it is in), no matter if the Category it is in is allowed or blocked. Ex: If you have the Films & Animation category allowed, but have a YouTube video within that category in the Blocked Videos & Channels list, then the video will always be blocked. Similarly, if you have the Films & Animation category blocked, but then have an educational film within that category in the Allowed Videos & Channels list, then the video will always be allowed. 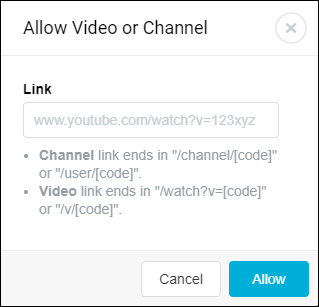 4) The Allowed Videos & Channels list always overrides the Blocked Videos & Channels list. You can have an entire channel in the Blocked Videos & Channels list, but if you have a single video from that channel in the Allowed Videos & Channels list, the video will still be allowed. Let us suppose you have the Films & Animation Category as allowed and have the Enable YouTube’s Restricted Mode option enabled. Instantly, all videos that are labeled as “restricted” by YouTube within that category are blocked, no matter what. Next, let us suppose that you have an entire Channel, “Shakespeare Films for Adults” (which falls into the Films & Animation category), in your Blocked Videos & Channels list because the majority of the videos in the channel are inappropriate… but, a teacher wants to show a single video of a film form that channel which contains age-appropriate content. You therefore place that single video into the Allowed Videos & Channels list. As a result, the entire “Shakespeare Films for Adults” channel is blocked, but the single video of the appropriate film from the channel is allowed. Note: Even though the Allowed Videos & Channels and Blocked Videos & Channels lists override Categories, Sealed Categories (categories that you are not able to toggle on/off, such as the “Offensive” category, which contains highly offensive material, and the “Illicit” category, which contains illegal pornographic material) override all lists. Navigate to After School Rules by clicking Internet Access > After School Rules in the navigation menu. 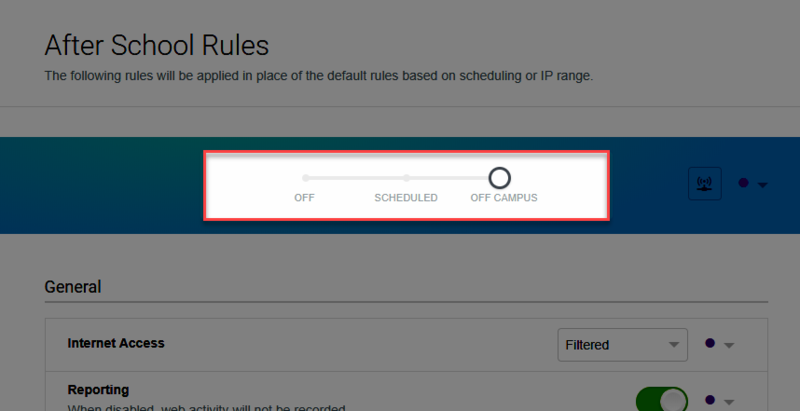 On the After School Rules page, you can enable the rules by adjusting the slider. You can apply After School Rules in two ways, according to a schedule (Scheduled) or when students are off campus based on IP range (Off-Campus). Note: After School Rules use your public IP address. To set After School Rules according to a schedule select the Scheduled option. After selecting the Scheduled option, you can set the start and end times for After School Rules. The After School Rules you set will only apply during the periods you specify. You can set separate schedules for weekdays (Mon-Fri) and the weekend (Sat, Sun). To set a schedule, enter the time you want After School Rules to take effect into the Start field and the time you want After School Rules to end into the End field. Set After School Rules according to IP range by selecting the Off Campus option. 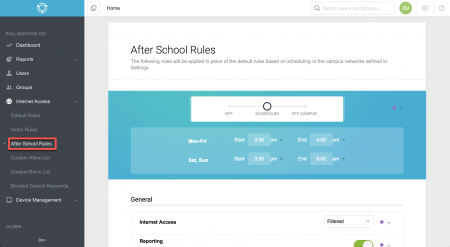 After selecting the Off Campus option, your After School Rules automatically apply when students’ devices leave your specified networks. 1. Enter your network name in the Network box. 2. 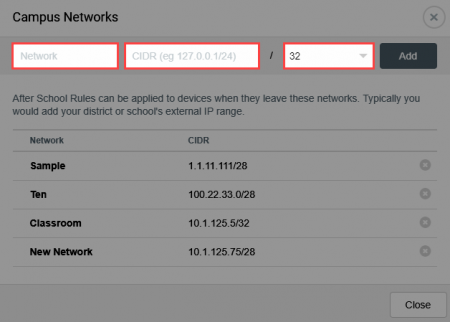 Enter your Classless Inter-Domain Routing (CIDR) number in the CIDR box. 3. Select your predefined CIDR switch from the drop-down menu. You will then see your network in the Network list. Add as many networks as necessary. You can delete a network from the list by clicking the to the right. Note: The CIDR is a range of IPs. Example: If your IPs range from 192.168.1.0 to 192.168.1.25, your CIDR is 192.168.1.0/25. You can use this tool to determine your CIDR. If you want to allow a website in a blocked category, you can easily do so by adding it to the Custom Allow List. Navigate to the Custom Allow List by clicking Internet Access > Custom Allow List in the left-side navigation menu. Sites in the Custom Allow List are never blocked. To add a site, type the site’s URL in the Search/Add bar and press Enter on your keyboard. Do not include a subdomain, not even www., unless you want to treat subdomains differently. For example, adding wikipedia.org will allow every subdomain of Wikipedia including en.wikipedia.org, fr.wikipedia.org, and so on. In contrast, allowing www.wikipedia.com will not automatically allow en.wikipedia.com. Note: If you are using Blocked Search Keywords, do not add the domain (for example, google.com) to the Custom Allow List. Verify the URL (reddit.com in the example below) and click Add to add the site to the Custom Allow List. Custom Allow List sites are ordered by date added. You can remove a site from the Custom Allow List by clicking the to the right of the URL. You can set the site to generate reports for flagged terms by checking or unchecking the Allow Flagging box. You can import a list (.csv or .txt) of websites by clicking the Importbutton ( ). The file should contain one URL per row or line and no more than 500 rows or lines. 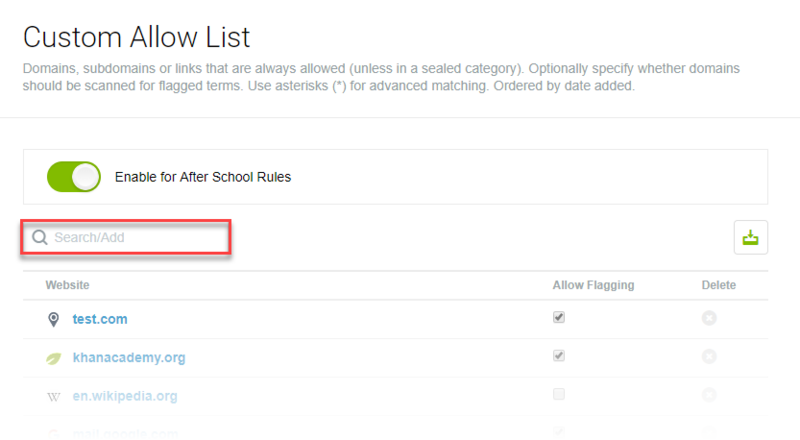 You can enable Custom Allow Lists for After School Rules by clicking the Enable for After School Rules toggle button. 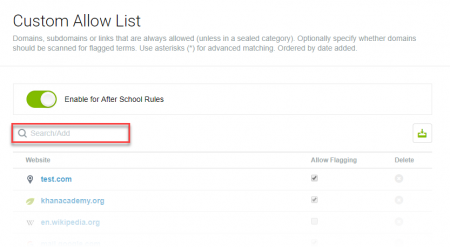 This allows the Default Rules to check against the Custom Allow List while After School Rules are on. If you want to block a website that is in an allowed category, you can easily do so by adding the website to the Custom Block List. Navigate to the Custom Block List by clicking Internet Access > Custom Block List on the left-side navigation menu. You can add any site to the Custom Block List. Sites in the Custom Block List are always blocked. To add a site, type the site’s URL in the Search/Add bar and press Enter on your keyboard. Note:Do not include a subdomain, not even www., unless you want to treat subdomains differently. For example, adding wikipedia.org will allow every subdomain of Wikipedia including en.wikipedia.org, fr.wikipedia.org, and so on. In contrast, allowing www.wikipedia.com will not automatically allow en.wikipedia.com. Verify the URL (reddit.com in the example below) and click Add to add the site to the Custom Block List. Custom Block List sites are ordered by date added. You can remove a site from the Custom Allow List by clicking the to the right of the URL. You can import a list (.csv or .txt) of websites by clicking the Import button ( ). The file should contain one URL per row or line and no more than 500 rows or lines. 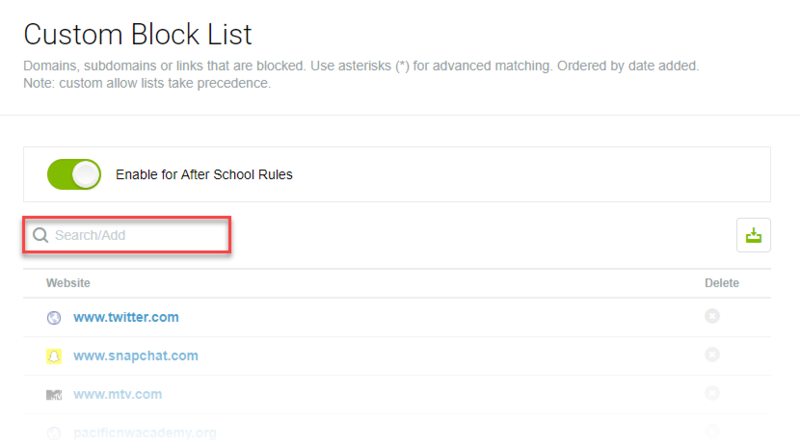 You can enable Custom Block Lists for After School Rules by clicking the Enable for After School Rules switch. 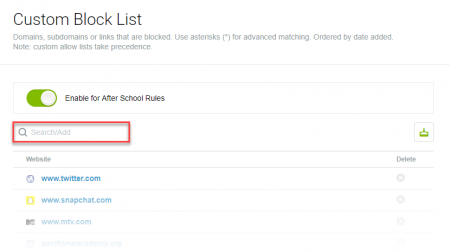 This will allow the Default Rules to check against the Custom Block List while After School Rules are on. You can use Blocked Search Keywords to stop your users from searching for specific words. Navigate to Blocked Search Keywords by clicking Internet Access > Blocked Search Keywords. Note: To block search keywords, you cannot have the domain (for example, google.com) in the Custom Allow List. You can add to the Blocked Search Keywords list either manually one keyword at a time or by uploading a .CSV or plain text file containing multiple keywords. Type the keyword you want to add in the Search/Add text box and press Enter to search for the keyword. If the keyword isn’t currently in the Blocked Search Keyword list, click Add to add it. Click the next to the search term to exit back to the list. Click the Import icon to the right of the search box. Click Choose File and navigate to your .CSV or plain text file on your computer. Note: The file must contain one keyword per row with a limit of 500 rows. 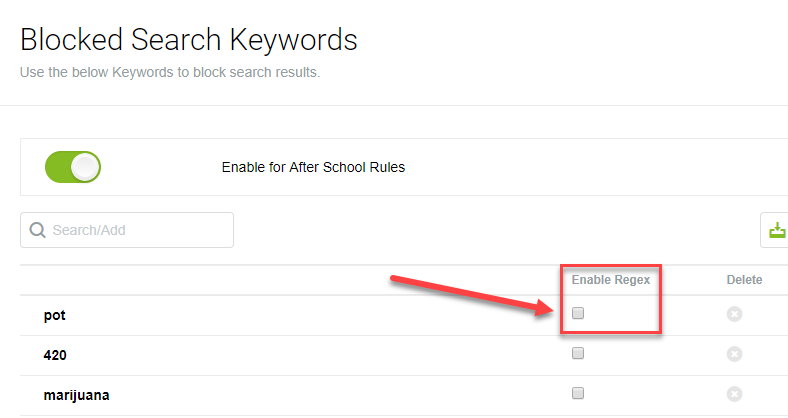 To enable the Blocked Search Keywords for your After School Rules, click the Enable for After School Rules toggle button at the top of the page. 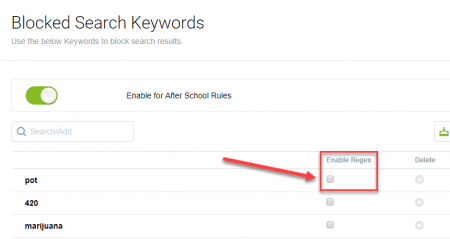 – indicates Blocked Search Keywords are enabled for After School Rules. 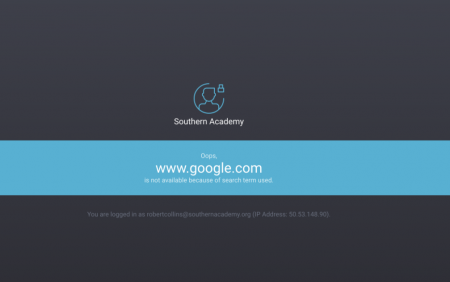 – indicates Blocked Search Keywords are disabled for After School Rules. You can have Relay match Blocked Search Keywords by Regex patterning. Regex is a special text string for describing a search pattern that gives you significantly more control over your Blocked Search Keywords. Regex pattern matching allows you to quickly analyze large amounts of content in order to identify specific character patterns. Enable Regex patterns in Relay for a Blocked Search Keyword by checking the box under the Enable Regex column next to the term.